Bankruptcy allows debtors to either reorganize and restructure debts or liquidate assets to be used to pay off creditors. The bankruptcy system generally endeavors to reward creditors who continue to extend financing to debtors and discourage creditors from accelerating their debt collection efforts. In voluntary bankruptcy cases, debtors petition the bankruptcy court. In involuntary bankruptcy cases, creditors file the petition. The automatic stay provision generally prohibits the commencement, enforcement, or appeal of actions and judgments against a debtor for the collection of a claim that arose prior to the filing of the bankruptcy petition. Under Chapter 7, a trustee collects the non-exempt property of the debtor, sells it, and distributes the proceeds to the creditors. Chapters 9, 11, 12, and 13 allow the debtor to keep some or all of his or her property and use future earnings to pay off creditors. insolvent: Unable to pay one’s bills as they fall due. financial distress: a term used to indicate a condition when promises to creditors are broken or honored with difficulty. Individuals or entities undergoing financial distress may be forced to consider bankruptcy. Bankruptcy is the legal status of an insolvent person or organization, that is, one who cannot repay the debts they owe to creditors. The principal focus of insolvency legislation and business debt restructuring practices is not on the elimination of insolvent entities but on remodeling the financial and organizational structure of debtors experiencing financial distress, so as to permit the rehabilitation and continuation of their business. The bankruptcy system generally endeavors to reward creditors who continue to extend financing to debtors and discourage creditors from accelerating their debt collection efforts. Bankruptcy cases are either voluntary or involuntary. In voluntary bankruptcy cases, which account for the overwhelming majority filed, debtors petition the bankruptcy court. In involuntary bankruptcy cases, creditors file the petition. Commencement of a bankruptcy case creates an estate. The estate consists of all property interests of the debtor at the time of case commencement, subject to certain exclusions and exemptions. The United States District Courts have jurisdiction over bankruptcy matters; however, each district court may “refer” bankruptcy matters to the Bankruptcy Court. Most district courts have a standing “reference” order to that effect, so that all bankruptcy cases are handled by the Bankruptcy Court. The US Attorney General appoints trustees for each of the 21 geographical regions in the US. These trustees maintain and supervise a panel of private trustees for Chapter 7 bankruptcy cases. Furthermore, a US trustee may be heard on any issue in any bankruptcy case, except for filing a Chapter 11 plan of reorganization. The Bankruptcy Code imposes an automatic stay at the moment a bankruptcy petition is filed. The automatic stay generally prohibits the commencement, enforcement, or appeal of actions and judgments against a debtor for the collection of a claim that arose prior to the filing of the bankruptcy petition. In other words, as soon as a petition is filed, a debtor is entitled to all the provisions of the Bankruptcy Code. The automatic stay also prohibits collection actions and proceedings directed toward property of the bankruptcy estate itself. A secured creditor may be allowed to take the applicable collateral if the creditor first obtains permission from the court. The court must either grant permission or provide adequate protection to the secured creditor that the value of their collateral will not decrease during the stay. Entities seeking relief under the Bankruptcy Code may file a petition for relief under a number of different chapters of the Code, depending on the circumstances. A case is typically referred to by the chapter under which the petition is filed. Liquidation under a Chapter 7 filing is the most common form of bankruptcy. Under Chapter 7, a trustee collects the non-exempt property of the debtor, sells it, and distributes the proceeds to the creditors. Because each state allows for debtors to keep essential property, most Chapter 7 cases are “no asset ” cases – meaning that there are not sufficient non-exempt assets to fund a distribution to creditors. A Chapter 9 bankruptcy is available only to municipalities, and is a form of reorganization, not liquidation. Because municipalities are entities of state governments, the power of Congress to adjust debts through bankruptcy is limited. Municipalities’ ability to re-write collective bargaining agreements is much greater than in a corporate Chapter 11 bankruptcy, and can trump state labor protections, allowing cities to renegotiate unsustainable pension or other benefits packages negotiated in flush times. 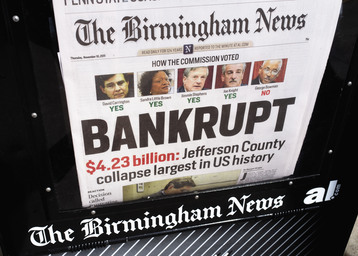 Chapter 9 Bankruptcy: Jefferson County, Alabama underwent Chapter 9 bankruptcy in 2009. Bankruptcy under Chapter 11, 12, or 13 requires more complex reorganization, and involves allowing the debtor to keep some or all of his or her property and to use future earnings to pay off creditors. Individuals usually file Chapter 7 or Chapter 13. Chapter 12 is similar to Chapter 13, but it provides extra benefits to “family farmers” and “family fisherman” in certain situations. Chapter 12 generally has more generous terms for debtors than a comparable Chapter 13 case would have available. Chapter 11 is commonly the form of re-organizational bankruptcy frequently entered into by businesses. Debtors may “emerge” from a Chapter 11 bankruptcy within a few months or several years, depending on the size and complexity of the bankruptcy. The Bankruptcy Code accomplishes this objective through the use of a bankruptcy plan. With some exceptions, the plan may be proposed by any party in interest. Interested creditors then vote for a plan. To avoid the negative impacts of bankruptcy, individuals and companies in financial distress can implement certain financial management techniques. Bankruptcy has the disadvantage of making it more difficult for an individual to borrow in the future, and companies that are reorganized and not dissolved face the risk of higher costs of capital for future operations. Before entering into bankruptcy, a company or individual can reduce debt obligations and take actions to increase income and profitability. During the period of reorganization, a company must reduce debt and increase profits in order to emerge from bankruptcy without losing control of operations. garnishment: A judgment that a third party should pay money owed to a debtor directly to a creditor. Financial Management before and during Bankruptcy is an effective method for companies and individuals to remedy financial distress and insolvency. However, it has the disadvantage of making it more difficult for an individual to borrow in the future and companies that are reorganized and not dissolved face the risk of higher costs of capital for future operations after emerging from bankruptcy. To avoid the negative impacts of bankruptcy, individuals and companies in financial distress have a number of bankruptcy alternatives. If the situation is too dire for such measures and a debtor does not expect to have steady income or property, it may be appropriate to utilize the take no action approach. In other words, the debtor should do nothing since a company with no assets or income cannot undergo garnishment by a creditor. In such cases, however, a creditor could attempt to seize. For the option of financial management during bankruptcy to exist, a form of bankruptcy allowing reorganization, such as chapter 11, must be used. Chapter 11 requires that all interested parties agree on a plan. Once confirmed, the plan becomes binding and identifies the treatment of debts and operations of the business for the duration of the plan. Under this plan, a debtor may be able to acquire financing and loans on favorable terms by giving new lenders first priority on the business’ earnings. The court may also permit debtors to reject and cancel contracts previously agreed to, if this would be financially favorable to the company and its creditors. If the company’s debts exceed its assets, the bankruptcy can result in the company’s owners being left with nothing. In such a case, the company’s creditors may be awarded with ownership of the newly reorganized company. During the period of reorganization, a company must utilize financial management, consisting of the options listed above, in order to emerge from bankruptcy without losing control of operations. Most creditors are willing to negotiate a settlement to receive a portion of their money and not risk losing everything in a bankruptcy. Negotiation is a viable alternative if the debtor has sufficient income, or has assets that can be liquidated so the proceeds can be applied against the debt. Debt restructuring is a process that allows a company or individual in financial distress to reduce and renegotiate its delinquent debts in order to improve or restore liquidity and continue its operations. Debt consolidation typically involves borrowing from one lender at a low rate of interest in order to repay a number of higher interest rate obligations. delinquent: Late or failing to pay a debt or other financial obligation, like a mortgage or loan. In general, creditors understand that bankruptcy is an option for debtors with excessive debt. Therefore, most creditors are willing to negotiate a settlement so that they receive a portion of their money, instead of risking losing everything in a bankruptcy. Negotiation is a viable alternative if the debtor has sufficient income, or has assets that can be liquidated so the proceeds can be applied against the debt. Negotiation may also buy the debtor some time to rebuild finances. Debt restructuring is a process that allows a company or individual in financial distress to reduce and renegotiate its delinquent debts in order to improve or restore liquidity and continue its operations. Out-of court restructurings, also known as workouts, are becoming increasingly common. A debt restructuring is usually less expensive than bankruptcy. The main cost associated with debt restructuring is the time and effort required to negotiate with creditors. Debt restructurings typically involve a reduction of debt and an extension of payment terms. A debtor and creditor could also agree to a debt-for- equity swap, wherein a company’s creditors generally agree to cancel some or all of the debt in exchange for equity in the company. These deals typically occur with large companies in financial distress, and often result in these companies being taken over by their principal creditors. Debt consolidation typically involves borrowing from one lender at a low rate of interest in order to repay a number of higher interest rate obligations. By consolidating debts, the debtor replaces payments to many different creditors with a payment to one creditor. This simplifies the debtor’s obligations and can result in faster debt repayment. 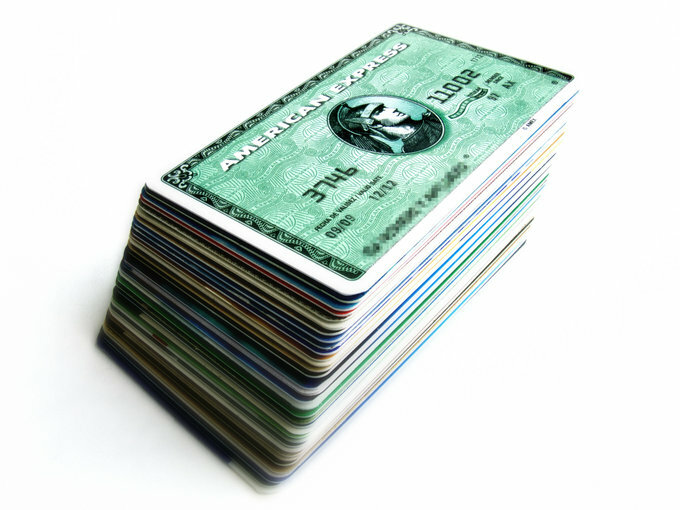 This is a common course of action for individuals owing large sums on multiple credit cards. Too Much Credit: Debt consolidation is one option for individuals owing large sums on multiple credit cards.